As we age, our bodies go through changes which includes our skin, hormones, and hair. The anti-aging business is very popular and apparently people are familiar with it as it is one of the hottest right now. If you think the anti-aging industry is just for your skin, you would be wrong! Products to help bring your hair back to a youthful texture, shine and feel are gaining in popularity daily. Some of the most common signs of aging for our hair is that it will get dry, dull, breaks easily, thins considerably and gets frizzy. I know my hair has become less full, has lost some of its shine and the texture is less smooth. One company you can trust with your hair are those from Jheri Redding and their Nexxus® hair care line. Worried that you will find your morning routine extended because your hair is getting older? Not with the fantastic Nexxus® Salon Hair Care Youth Renewal™ line that allow you to have that glorious and easy wake up and go hair! Jheri Redding is has been a leader in the beauty industry and started 3 of the major hair companies in the world. During the last 30 years, Redding created the Jheri Redding Products Co., Redken and Jhirmack Enterprises. All of these companies quickly became well known for their high quality hair care products which could be found in salons all over the world. In 1979, Jheri and his son, Stephen decided to start Nexxus® hair care, which means connecting or binding together in Greek. The idea for the word came from the vision of connecting nature and earth with science and creating a line of hair care products. Now, 35 years later, the company is stronger than ever and has just added their Nexxus® Salon Hair Care Youth Renewal™ line to help correct the effects of aging on your hair. 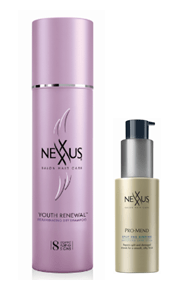 The Nexxus® Youth Renewal™ Rejuvenating Dry Shampoo, as well as the Nexxus® ProMend Split End Binding Smoothing Shine Serum are 2 great products for any type of hair. Whether you have aging hair or hair that needs just a little help in the morning, these are perfect. 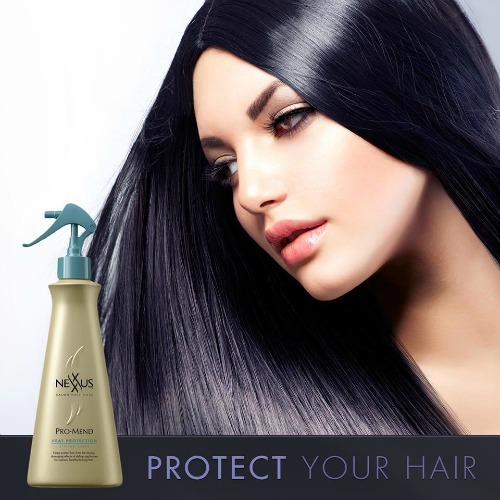 The Nexxus® Salon Hair Care ProMend, which sells for $11.99, is the first product on the market split end system that with continued use, binds up to 92% of damaged ends back together. Also, if you use just a dime sized portion in the morning, you can erase that frizzy and frazzled look sleeping on a pillow can cause. With the Nexxus® Youth Renewal™ Rejuvenating Dry Shampoo, you just spray it on your roots, rub it into your scalp and brush it out. The lightweight formula, which sells for $17.99, will absorb excess oil but will not leave behind any gross residue. You can purchase these and the other fins Nexxus products from fine retails stores that carry quality hair care products. Be sure to follow Nexxus on Facebook and Twitter.